Dental Clinic Anja Siegl, dr. dent. med. | Zobna Ordinacija Anja Siegl, dr. dent. med. – We take time and adjust the treatment according to your needs. – We can start with the treatment at any time as we are not bound to waiting periods. – Thanks to our ongoing training’s, the use of up-to-date materials and the ways of treatment the chances for a successful treatment are greater. – We guarantee affordable fees throughout the whole treatment process. INITIAL EXAMINATION INCLUDED IN THE PRICE OF OUR SERVICES WITH VALUE OF 50 EUR OR MORE ! Choose one of our services in value 50 eur or more and get examination in the same appointment for free. Book your appointment online now. For all questions and appointment requests we are available during holidays on e-mail or SMS. Outside working hours available on SMS or e-mail. In urgent cases, we respond as soon as possible. Appointments available within two weeks. Let your teeth be treated by professionals with help of top-quality modern materials of proven brands. Perfect recipe for quality service. With pleasant atmosphere and relaxed personnel we listen to your problems and help you lose your fear of dental procedures. With the help of technology, you can choose by yourself, when you would like to visit us. The app allows you to make appointments, when it suits you best. Outside working hours as well. We believe in private dentistry as this is the only way we can take enough time for every patient and can so provide best quality for affordable price. We are dedicated to providing total and individual dental care. The studio was established over 30 years ago and has had a long-lasting family tradition. Central to our ambition is to provide high quality patient care. We maintain high professional standards in comfortable and friendly surroundings in the very heart of Ljubljana. We are committed to meeting your expectations for high quality dentistry. As we have enough time available for you, we can focus on your problem and solve it professionally. We cherish your time, so you will never have to wait long in the lounge, but you simply come at the time of your appointment, which can take place whenever you want to. We use top quality and most up-to-date materials of established trademarks. All our services have a guarantee. Our aim is the sustainability of our work and your satisfaction. Dental caries or dental decay is a common dental disease and begins as a consequence of bacterial degradation of hard dental tissues. It is one of the main reasons for bad breath, toothache and inflammation of dental pulp, which can lead to its necrosis. Treatment of dental caries consists in the first phase of treating the teeth with fluoride varnishes, with which we can arrest the caries in its initial phase. If dental decay is already expanded into the depth, the tooth has to be restored with a filling. First we remove the damaged dental tissue and we replace it with a corresponding material. 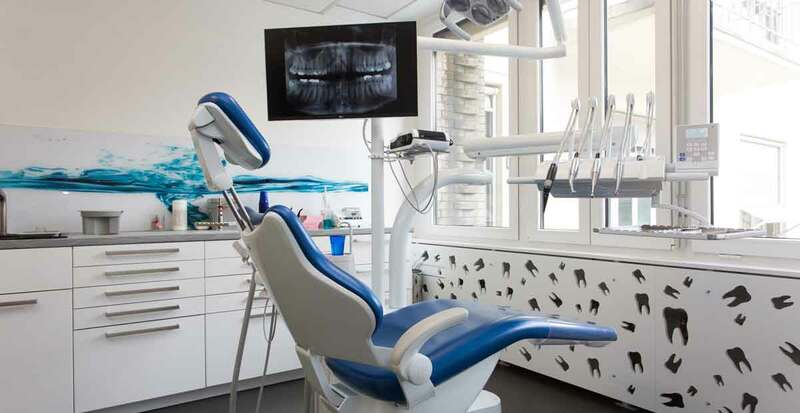 In most cases, we use composite materials, which are functional and provide aesthetic results. The procedure can be done under local anesthesia and provides durable results as we use reliable instruments and materials. Endodontics or root canal treatment is a procedure, with which we can treat a tooth with an inflamed or necrotic pulp. First, we have to make a diagnostic x-ray to provide us information about the caries depth, shape and number of the roots and their relation to the surrounding tissues. First we check, if the tooth is still vital or not and apply local anesthesia. Then, we remove the inflamed or non-vital dental pulp and clean the root canal spaces with disinfecting solution, rotary and ultrasonic instruments and electronically determine the length of the root canals. It is possible to make a permanent root filling in the same or in one of the subsequent sessions. When this is completed and confirmed on the x-ray, we can proceed with restoring the tooth with a filling, or in case of greater defects, a post and core, inlay, onlay or crown. Dental implants are titanium screws, which can replace missing teeth and are surgically inserted in the jaw, in the bone on the site of the root of the missing tooth. If put in a healthy bone tissue, dental implants are more stable than a denture. Besides that, there is no need to damage the neighboring teeth with preparing them in the case of bridges to replace the missing ones. So the neighboring teeth can remain intact. The feeling and appearance is similar as with the natural teeth, and the patient again can smile self-confidently. Also the function with eating and speaking is very similar as with natural teeth. In contrary to the denture, we cannot remove such a restoration by ourselves, it is usually permanently fixed. Fixed restorations can be made on the teeth or implants. A crown is fabricated, when the loss of dental tissues is so big, that it is not possible to restore a tooth with a crown, inlay or onlay. A bridge connects more crowns with pontics, which replace the missing teeth in between. Today, most aesthetic material for such restorations is porcelain, which can be be fused to a metal base (metal-ceramic restorations) or base, made of stronger ceramic materials (all-ceramic restorations, made with zirconium etc.). Dentures are removable prosthetic appliances, which replace all teeth in edentulous jaw (total removable dental prosthesis) or only a part (partial removable dental prosthesis), when not all of the teeth are missing. It can be a temporary (during the treatment, which is still in progress) solution or a permanent one, if there are not enough teeth or implants for fixed restorations or the teeth remaining are not stable enough for a fixed restoration. Esthetics can be excellent with help of an experienced dental technician and usage of quality materials. Although a denture still is a removable solution, which means it can be removed from the oral cavity for cleaning and maintenance of oral hygiene, it can still have good stability, especially when there are some teeth or implants available to support it. Minor surgical procedures, performed in our dental practice, are laser gingivectomy (removal of an excessively grown gums), incisions of abscesses etc. We also perform tooth extractions of teeth with hopeless prognosis, when it is impossible to save a tooth even with the most advanced materials and methods. Implant surgery is done with cooperation of a specialist. Oral hygiene is a crucial part of preserving healthy teeth, gums and oral cavity in general. Besides thorough dental care at home it is necessary to perform professional oral hygiene measures at least once a year, in cases of greater risk for periodontal disease even more often. Oral hygiene in our dental practice is performed with ultrasonic devices, which do not damage tooth surface, and with polishing to get a smoother tooth surface. Extrinsic staining is removed, we instantly achieve brighter teeth in a natural way, and what is more – we prevent gum inflammations and periodontal disease. Bleaching is performed in several ways, either in-office or at home. We mostly perform in-office bleaching with laser, which gives us predictable results. We perform esthetic dental procedures in line with our patients’ individual requests. In our dental practice we help you to achieve beautiful smile with invisible orthodontic appliances. Invisalign helps align teeth with a series of invisible splints, fabricated individually and based on the requested results for a use, simple and convenient for the patient. In that manner, Invisalign minimally interferes with your everyday lifestyle. Invisible is a removable orthodontic appliance, which means you can simply take it off and place it on again all by yourself. In the end, you get a beautiful smile, which can change your life. When you change your splint every two weeks, your teeth gradually move to desired position, as planned at the beginning of the treatment. Smile self-confidently again, just like more than three million people, who trust Invisalign all over the world. We will be glad to help you in our dental practice. The price list contains the vast majority of most common services and is meant for your orientation. Fees may be lower; depending on discounts we offer at certain period. All prices are in EUR and we accept cash only. The price list entered into force on January 1, 2018. * The booked appointment must be canceled as soon as possible, no later than 12 hours before the appointment via the telephone number of the office (+386 31 778 296) or by e-mail info@zobna-ordinacija.com. In the case that the booked appointment is not canceled within the 12-hour period, it is considered as a no-show and costs may apply. I’AM “NIGHT OWL“ AND ALWAYS FORGET TO BOOK APPOINTMENT DURING WORKING HOURS. WHAT TO DO? BLEEDING OF THE GUM – WHAT TO DO? When you come for the first appointment, the dentist will first talk to you about your issues and expectations. As the first appointment is the basis of treating your teeth and oral cavity, the dentist takes enough time to answer all your questions and explain all possible fears. After it, she checks up your oral cavity, periodontal tissue and teeth, and marks all observation on a special form sheet. An important part of the first appointment is presenting you with correct teeth and gums cleaning and care that you will do at home. For booking your first appointment online click here. Because we want to adapt to you and your needs, we provide online reservations 24/7. Everything is quite simple and is done in just a few clicks. Just click here and follow the instructions. If you have any questions, you can contact us on contact form here or send an email to the email address info@zobna-ordinacija.com . Oral hygiene that you do at home is of the utmost importance for healthy teeth and the success of teeth and gum treatment. If you do not do it properly at home, all effort in the studio will be in vain. In case you need additional advice regarding oral hygiene, you can book an appointment here. We recommend cleaning teeth twice daily, in the morning and in the evening. Use a soft toothbrush and pull it from gum to teeth – from red to white. Every tooth shall be brushed from eight to ten times. Use a smooth toothpaste, aggressive ones are not recommended. It is very important that you use dental floss or an interdental toothbrush twice daily, after having cleaned your teeth. With a toothbrush we cannot reach all parts of a tooth as well as the gum. When using dental floss or an interdental toothbrush pay attention not to be too harsh to the gum, otherwise you can easily hurt it. Bleeding of the gum is in the most cases a result of inflammation, which is a consequence of tartar formation and dental plaque. If you do not take proper dental care, tartar and soft dental plaque build up, and consequently the gum is inflamed, therefore it can bleed at the touch of a toothbrush or dental floss. After a few weeks of profound, regular and soft cleaning the inflamed gum will stop bleeding. If your gum is bleeding, book an additional advice and appointment here. If the bleeding has been present for a while, it may mean that inflammation has progressed. A pocket between a tooth and the gum is deepening, which is so called a periodontal pocket. The gum starts receding. In such a case we talk about periodontal disease, which means that we may lose our teeth. In both cases we recommend an appointment in our studio, where the dentist will, with the help of a dental hygienist, remove the tartar and dental plaque – soft dental plaque and will explain and teach you about correct teeth and dental floss cleaning techniques. Squeezing the dental tampon in the mouth for at least half an hour, but preferably longer. In case if appears, that bleeding after extraction hasn’t be stopped, bite again on a sterile dental tampon or sterile cotton tissue over the wound and bite with teeth for at least half an hour. The wound, which remained after tooth extraction we leave alone and try not to have any physical contact. Cleaning teeth after extraction is recommended as ussual, but not immediately after extraction., with caution around the place of extracted tooth . It’s recommended to eat cool and soft foods and drink (nothing hot), as long as health permits, enjoy some ice cream. Smoking and alcoholic beverages should be avoided. On the face on the side where the tooth was extracted put cold compresses. If the following tooth extraction pain occur, we may take the analgesic, but not based on acetylsalicylic acid (no aspirin). Don’t wash mouth with home-made solutions and mouthwashes until the wound is healed.. If it comes to the sudden intense pain for more than three days after tooth extraction, fever, problems with opening mouth, severe swelling, bleeding, is advisable to come on the control at the dentist. Good oral hygiene: dental implants require special attention in order to ensure their long life. In both of the binder is fused gums resilient than epithelial coupled at a dental implant which has a more gentle and therefore more susceptible to the ingress of bacteria. Healthy gums: the absence of gingivitis dis a necessary condition for the successful dental implants treatment, as periimplantitis (inflammation of the jaw bone around the implant) caused by similar bacteria than periodontal disease. Enough of the jaw bone: a sufficient height and density of the jaw bone is important but not necessary. With different operations missing bone can also be added. With implants we need to be particularly attentive to good oral hygiene. As well as in the natural tooth tissue around the implant is susceptible to bacterial infections, and therefore may be with poor hygiene and with the conditions for infections bringing to loss of tooth and same with the implant. It is necessary to use dental floss at least once daily and brushing twice daily as well as visit the dentist at least every six months for inspection and cleaning. To smokers is advised to stop smoking because it can disrupt healing of the wound in the mouth, accelerates the degradation of the jaw bone and so reduce the chances of success of the implant treatment. We answer you as quickly as possible. Copyright by Zobna ordinacija Anja Siegl, dr. dent.med. All rights reserved.